Force Crag is a historic lead mine located at the head of the Coledale Valley, in the shadow of Grizedale Pike, in the hills above the village of Braithwaite. The mine has had several distinct phases of operation; it opened in 1839 as a lead mine, a function it fulfilled until 1865. From 1867 it was converted into a zinc mining operation, and though it was never terribly successful, it stayed more or less afloat as a business concern until the latter part of the 20th century. The mine was finally abandoned for good in 1991, making it the last working metal mine in the Lake District. It is now under the care of the National Trust, and visitors can view the old mining machinery, and the partial remains of mountain tramways, tracks, an aerial ropeway, and other remains of the mining works. The crushing mill, built in 1909, still stands, as does much more modern equipment that was used into the 1980s. 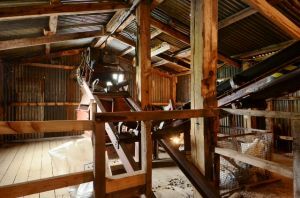 At this time the mine buildings can only be visited by National Trust pre-booked tours on specified dates throughout the year. Please see the Trust website for upcoming dates and times. Location: Access by footpath only, from Braithwaite village, a distance of 2.75 miles, or from the Noble Knott car park on the Braithwaite to Lorton road (a much shorter walk).